Pte William Henry Watson (born 9th June 1883) of the 2/5th East Lancs Regiment, 3863 C. Company 11th Platoon, Reg no: 241478, joined the Army 12th May 1915. 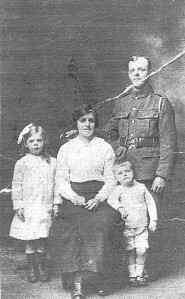 He served in England, France and Belgium as a Lewis Gunner and was taken prisoner 21st March, 1918 and returned to England 5th December. He was finally discharged on 27th March 1919 as a repatriated prisoner of war. Information kindly provided by Sues.